4 Beds 2 Baths 2,026 Sq. 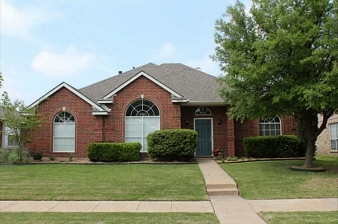 ft.
Beautiful home with manicured landscaping. Spacious, split bedroom floor plan-two living spaces, brick fireplace,two dining areas & a large kitchen updated with granite countertops, stainless steel appliances & refinished cabinets. Oversized master and master bath-garden tub, detailed tile work & vessel sinks. Three addtl.bedrooms and updated second bath-granite countertops. Recently replaced roof,AC & heating units, carpet & fence.